As the years pass, Henry becomes entrenched in his own memories, fantasies, and near obsessions with the lives of his former classmates, who have all moved on. The true question remains in the balance - does Henry have the ability to dig himself out of his gloomy, bleak hole and start living, or does his passion for life die along with the closing of Baxter's? Flock's style in Everything Must Go is intimate, real, and honest, with a twist of cynical. The story of Henry Powell will hit home to those who have experienced one or more periods in their lives in which everything appeared to be at a stand-still. The novel is truly a detailed look at the inside mind of a person who feels they have made the wrong choices in life - which is exactly why I think this novel is genius, interesting, and captivating. As Henry ages throughout the book, his persona and rants become noticeably crazier. Novels like Everything Must Go inspire me to interview the author - to learn more about their inspiration behind the writing, and how they were able to write and get inside the mind of such a complex character. Did Flock experience a period like this in her own life? Did she witness someone close to her live a life similar to Henry's? Either way, it is almost relieving to read about such a person's experiences and learn you are not alone in having similar thoughts and feelings from time to time. An additional fun factor in Everything Must Go is that many of Henry's flashbacks occur during the 1980s, at which Henry, through Flock's voice, pokes endless fun. In fact, I can nearly sense the fun Flock had while writing these passages. There were numerous times throughout the novel that I laughed out loud, and insisted on reading sentences aloud to friends and family. I wished I had made notes of these instances so I could point them out in this review. One of my favorite Henry-isms is when he makes fun of the song "Smooth" by Rob Thomas and Santana, stating that Rob Thomas has no talent and no idea how to sing. As it currently stands, "Smooth" is one of my all-time hated songs, so I fell in love with this novel unconditionally after reading this passage. Upon finishing Everything Must Go, I was disappointed to see that this novel has just under 3 stars on Amazon and Goodreads. If readers had given it a fair chance, they might have been able to see the genius in this work. Elizabeth Flock is now on my favorite authors list next to Carolyn Parkhurst and Dani Shapiro, which are my other two all-time favorite literary authors. I absolutely can't wait to read and review Flock's other novels, which are displayed below. Fans of Elizabeth Flock should also try novels written by Parkhurst and Shapiro, shown below. Click on any of the book images to review them in more detail on Amazon.com. 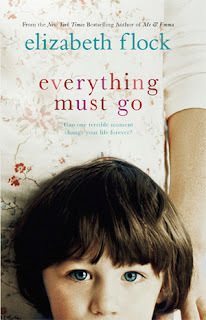 What did you think about Everything Must Go? Do you agree, or disagree with my review? Share your thoughts with me in the comments section below! Me and Emma was great but I haven't read anything else by Elizabeth Flock. I might buy the followup you mentioned too. Reading negative reviews about certain books makes me want to read them to see what the buzz is about, and I really appreciate this particular review. Thank you for bringing it to my attention! This sounds good because I think most people feel at some point in life that everything is at a stand-still. I don't like the Smooth song either, it's waaaay overplayed. Thank you for the nice review, it's well-written. I really liked Emma & Me so I hope I like this book too. Thank you Dreamworld Books!